Another FAN program! Amy Cuddy, Wednesday, January 27, 2016, Presence: Bringing Your Boldest Self to Your Biggest Challenges, 7:00 PM, New Trier High School, Northfield Campus, Cornog Auditorium, 7 Happ Rd., Northfield, 60093. Harvard Business School social psychologist Amy Cuddy, Ph.D. has captivated viewers worldwide with her 2012 TED Talk about the science of “power posing” – the second most viewed talk in TED’s history, with over 30 million views and counting. 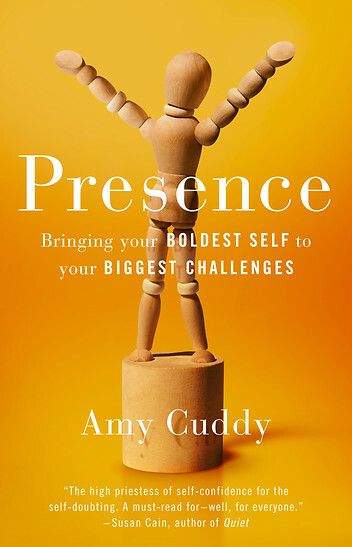 Now, in her first book, Presence: Bringing Your Boldest Self to Your Biggest Challenges, Dr. Cuddy explains the science underlying power poses and many other fascinating body-mind effects, and teaches us how to use this science to become self-assured in life’s most challenging moments. Cutting-edge science reveals that if we adopt behaviors reflecting power and strength, we liberate ourselves from the fears and doubts that obstruct us. By redirecting our thoughts, actions, and even physiology, we change not only our minds but also our biology, and free ourselves to be our best. The results are not just a change in mental outlook, but actual biological changes – our testosterone increases and our cortisol decreases. More simply, our power increases as our fear decreases.